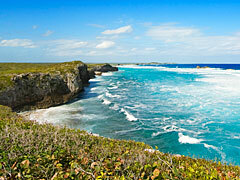 Al's Rent A Car offers car rentals in North and Middle Caicos to meet every traveller's needs. Whether you are looking for cheap cars or cars fit for the stars - Al's Rent A Car has the car rentals for you. Do you have questions and/or inquiries? Just send us a message and expect a speedy reply from us within 24 hours. We offer the best car rental packages in the Islands with a variety of vehicle types that will suit your needs. We are operating for years and always working to be the best that we can be. A reliable and dependable local car rental company. Welcome to our lovely Islands! To help you enjoy your stay here we offer the widest range and biggest fleet of vehicles to suit your needs in getting around North Caicos and Middle Caicos (the Twin Island). Born out of a merger of the three oldest vehicle rental companies on the Twin Island, we proudly offer our customers an excess of 30 years experience in the business. Al's Rent A Car is committed to offering our customer the best service, the best vehicles, the best value and the best experiences. We offer free pick up and delivery from the Ferry Landing in Sandy Point or at your home away from home here in our islands. You can reach us at (649) 241-1276/345-7422 Feel free to call or contact us via email for any further inquiries. 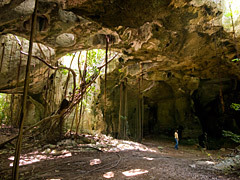 Conch Bar Cave is the largest above ground cave system in the entire Bahamas - Turks and Caicos archipelago. 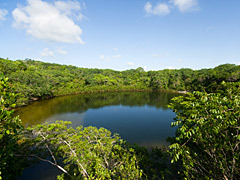 Explored by divers in 2001, this scenic 150 foot diameter fresh-water pond was found to have cave systems going down as deep as 250 feet. This is also an excellent site for bird watching. Easy stop right off of Sandy Point Road. 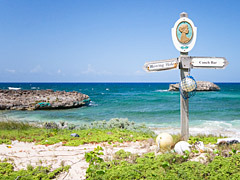 Traditionally the main link between North and Middle Caicos, Crossing Place Trail is a mildly-strenuous path that leads along the breathtaking cliffs and beaches of Mudjin Harbour. It’s best to wear shoes or boots when hiking this trail as some areas can be rocky. One small boat charter operator offers one or two tank dives from North Caicos. Gear is available for rent, or bring your own. 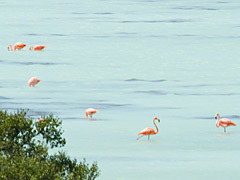 1000s of Greater Flamingos can be seen at times at the Flamingo Pond overlook. The overlook is a distance from the pond, so it helps to bring binoculars. 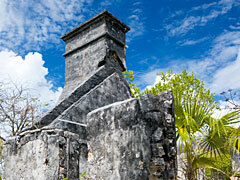 About two miles north of the Lorimers settlement is Haulover Plantation ruins. 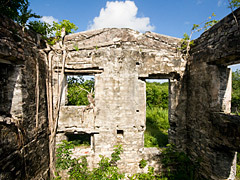 Constructed by John Lorimer in 1791, Haulover was one of the largest plantations ever in the Turks and Caicos. 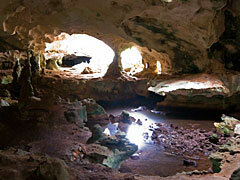 Indian Cave is a single gallery cave with many openings and skylights. It can be found just off the main road about half a mile west of Conch Bar Village and is well worth a quick stop. Many impressive beaches are found on Middle Caicos, including Mudjin Harbor, the finest landscape in the Turks and Caicos. 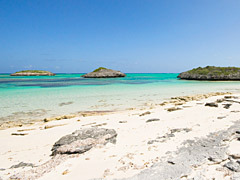 The Mudjin Harbour coastline offers what many consider to be the finest scenic landscapes in the Turks and Caicos Islands. Mudjin Harbour consists of two miles of spectacular high limestone cliffs and white sandy beaches. 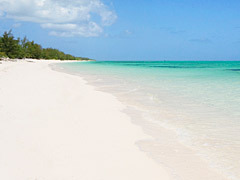 North Caicos offers many beautiful white sandy beaches for you to explore, all of which are located on the north shore. 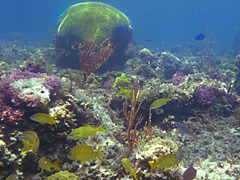 Most are secluded and deserted, and several good snorkeling spots can also be found. Found on the north coast between Sandy Point and Whitby, Three Mary Cays are three tiny rocky islands right near the beach. The scenery is beautiful here and there is excellent snorkeling not far out. This area can be difficult to find, so be sure to check the map before journeying. Found near Kew on North Caicos, Wades Green is the best preserved and most famous historical plantation in the Turks and Caicos.